1 Bedroom Flat For Sale in Berkshire for £240,000. SHOW APARTMENT LAUNCHING 27th & 28th APRIL 10.00am - 5.00pm. 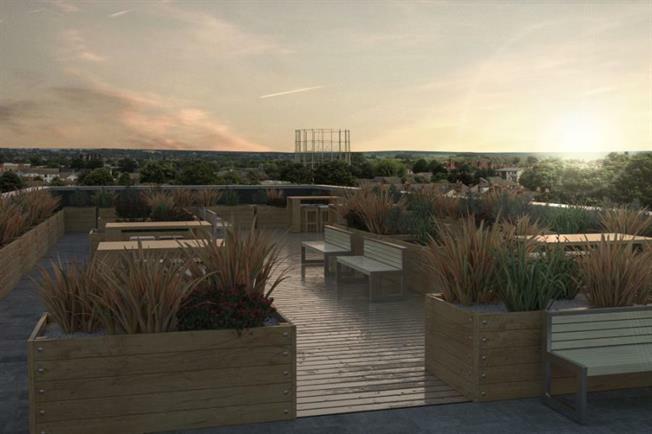 Roof Garden and Secure basement parking to selected plots. 300 Kings Road is an exclusive development offering contemporary studio and 1 & 2 bedroom apartments within the thriving centre of Reading. Benefiting from a landscaped sky garden and the convenience of a concierge, elevator to serve all floors, 300 Kings Road has been created to surpass the expectations of today's busy professional. The 1 bedroom apartments at 300 Kings Road all come with one parking spaced and will offer modern fitted kitchens with integrated appliances, LED lights, Satellite TV connection points to the living room. 20% Equity loan covered by a Homes and Communities Agency equity loan which does not have to be repaid until you sell. Reading boasts a rich cultural heritage with year-round arts & leisure activities, and an excellent choice of shopping and dining opportunities. The towns excellent position at the start of the Elizabeth Line provides a quick 26-minute hop into London, and an excellent opportunity to capitalise on the transformative effect of the new line, which is set to slash commute times across the capital. Located on the both the Great Western Railway and the M4 Motorway, Reading also lies in an enviable position, surrounded by unspoilt countryside and tranquil stretches of water from the River Thames and River Kennet. Reading, the business capital of the Thames Valley, is one of the most dynamic and prosperous towns in the UK and is recognised for its productivity and entrepreneurial spirit, making it one of the best locations for economic expansion and business growth in the country. It has the highest density of tech business in the UK and is home to 13 of the world's top brands, including: Microsoft, Vodafone (Newbury), Oracle, Royal Berks, Yell, Symantec, BG Group (Oil & Gas company parented by Shell), Cisco and Verizon Business. The area boasts a selection of leading private schools and two top-performing grammar schools, as well as a wide choice of private schools nearby. In addition, the University of Reading, with 17,000 students from 150 countries, is ranked in the top 200 of universities worldwide. With its close proximity to London the rail links are exceptional; there's a 25-minute direct rail service to Paddington Station, which departs every 15 minutes, and a 40-minute direct rail service to Heathrow. In addition, Crossrail is clearly going to be a major part of Reading's transport links, with a further 40 stations, which will provide reduced journey times as well as access to some of London's main employment centres, such as Canary Wharf and The West End. Reading's excellent rail links are also complemented with easy access to the M4 and M25. Please note: Any CGI's shown are subject to change without notice and may not reflect the advertised apartments. The floor plans shown are for guidance purposes only and are subject to change without notice. No Liability will be taken for any changes made to any stated specifications, images or floor plans.